You already have potential clients and anonymous visitors coming to your website. If you just knew who they were that would be a good lead, right? Well, now you can know! With Lead Sight Pro, you’ll get access to a wide range of features, including: Anonymous Visitor Identification and Website Visitor Tracking, which delivers real-time alerts, details on the companies visiting your site, and the ability to obtain their contact information. Just imagine calling your prospect while they are sitting at his/her desk reading about your product or service. 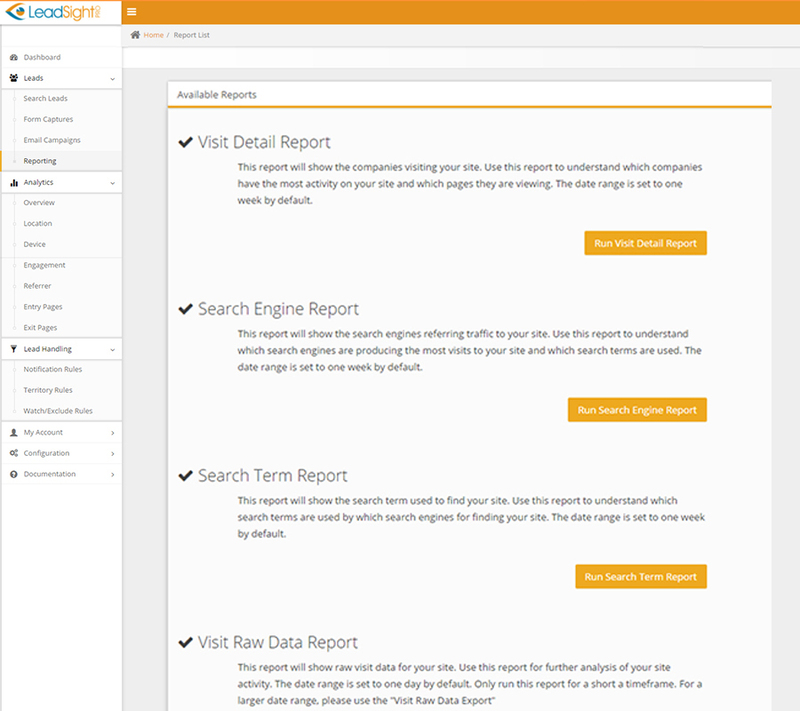 Lead Sight Pro’s anonymous website visitor tracking and lead generation software will identify visitors or companies viewing your website. We’ll tell you which of your products or services they are interested in and we do this with real time email alerts so you don’t miss a beat! Knowing the pages viewed and the time spent on each of those pages shows you an interest level that can be a measurable way to determine the interest level of a potential client – or a current client. You just cannot get that with a cold call alone. Once you know how engaged your potential/current customer was while they were on your site, you can outline your sales pitch accordingly. The rest of the sales process is up to you. We provide you the tools to succeed. You’ll also be able to tag the lead and be immediately alerted when they come back to your site. This is a tremendous benefit for your sales department. 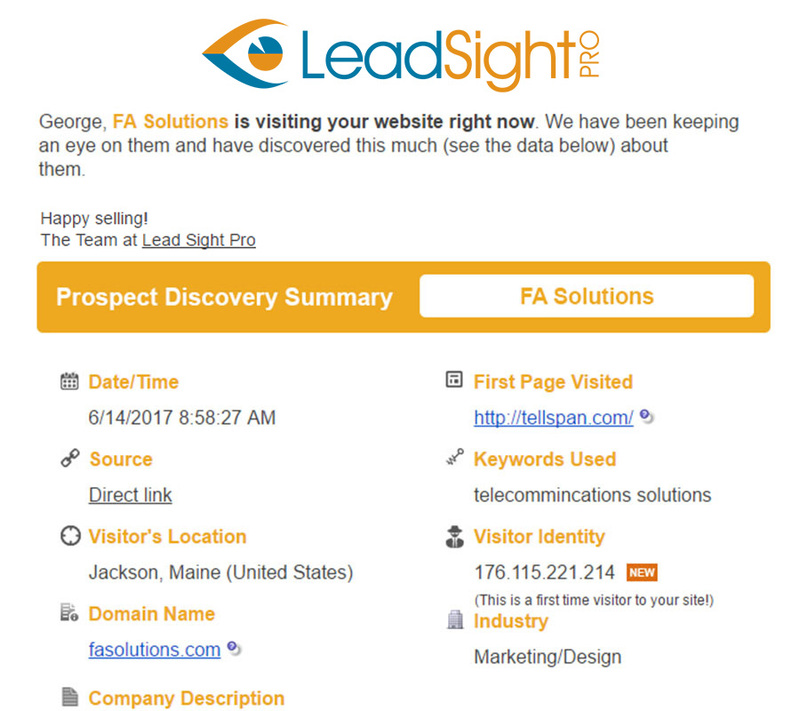 Equip your sales team with Lead Sight Pro and they will have perfect timing with their sales calls knowing that a prospect is currently on your website. The trial is free and all the leads you receive during the trial are also free. Lead Sight Pro is very affordable and our service works with any website. Lead Sight Pro will help you get a bigger bang out of your SEO or pay per click project. When your SEO campaign generates an influx of traffic, you’ll have names and numbers to follow up with. What are you waiting for? Sign up for free trial now. You have everything to gain and nothing to loose. The install to your website will take you or your webmaster only 5 minutes. And you will begin receiving leads within minutes of your successful install. Stop guessing. Start Selling. Still unsure that website visitor tracking and anonymous visitor identification can help your business grow? Start your FREE 14-day trial and experience the website visitor identification tool so many businesses trust. This trial does not require a credit card and has no obligations. Try Lead Sight Pro today! From an Instant Email Alert: This alert will provide you with detailed information about the visitor, their company, the pages viewed, their history, and also include research information like prepopulated links to research sites, keywords used, and any email campaign information. This method does not require you to log in to the dashboard for any of the information about this visitor. 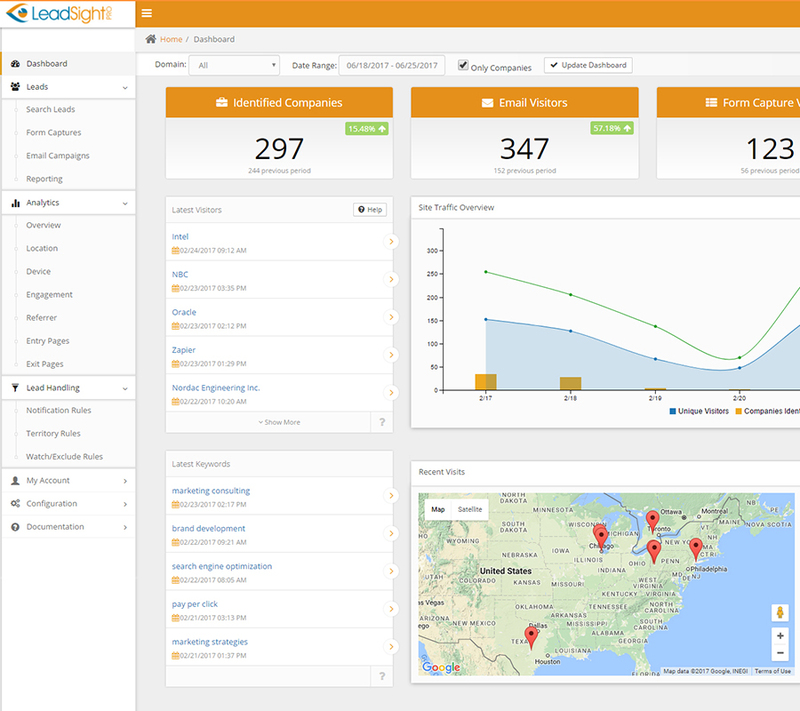 From the Lead Sight Pro Dashboard: We have a very in depth and intuitive dashboard available to our customers with live stats showing company visits, email visitors, form captures, page views, and more. You can also see your latest visitors from the main screen, or go to the search leads page for a full listing. From here you will also have the in-depth data mentioned above for each visitor. Exported Listings: Not all data needs to be seen, and we have many customers who like to have their visitor lists exported and sorted in a way that is customized to their specific needs. This option is available from our report tab – along with other reports.